History and nature create a wonderful confluence in Pollachi, which will delight travelers with the widest of sensibilities. Pollachi lies 50km to the south of Coimbatore. Pozhil Vaichi, Porull Aatchi, Porul Achi – the commercially, industrially, historically important scenic town of Pollachi has been called by many names in the past. Nestled in the foothills of the Western Ghats around 50km south of Coimbatore, Pollachi is known by many names – Mini Kodaikanal, Mini Kodambakkam and even Coconut City. Pollachi has been a historically important town, known as Mudi Konda Chola Nallur (‘Crowned King’) during the time of the Chola kings of the south. It earned the moniker of ‘Pozhil Vaichi’ (‘Land of Natural Wealth and Prosperity’), which one can find carved in the Lord Subramanyar temple in the town. The ancient 8th-century temple is believed to have been a Shiva temple dedicated to Agastheeswaram Udaiyaar, with the Subramanyar being the festival deity. Pollachi was also known as ‘Porull Aatchi’ (‘Land of Wealthy Government’). It is said that the Pollachi Sandhai (Pollachi’s market) sold and bought anything and everything once upon a time, including elephants, agricultural products, iron, cattle and even coconuts, earning Pollachi the affectionate nickname of ‘Coconut City’. The market is one of its kind, with the jaggery market in the town being Asia’s largest. Pollachi is also called as ‘Mini Kodambakkam’ and ‘Mini Kodai’ because its scenic locales have been used as filming locations by the Hindi, Malayalam, and Tamil film industries. Pollachi is where the blue sky meets the green undulating hillsides, making for vivid memories. Pollachi’s near–pleasant year-round climate is attributed to its location near the Western Ghats. However, the best time to visit the town is during the monsoons (June– October) and winters (December–February) when the temperatures are between 16 and 22 degrees Celsius. The nearest airport from Pollachi is in Coimbatore which is 48 Km away. Nearest railway station for Pollachi would be Podanur Junction which is about 34 km. Coimbatore railway station is 38.21 km where all major trains would halt. Yercaud, a.k.a. the “Jewel of the South’, is a kaleidoscope of blue and green and caters to the whims and fancies of every kind of traveler. The town lies in the Eastern Ghats Shevaroys Range, 370 southwest of Chennai. Travelers can visit the Kiliyur Waterfalls, Pagoda Point, Lady’s Seat, the Silk Farm. Rose Garden, Deer Park and Bears Cave, the Kottachedu teak forest, Anna Park and Yercaud Lake, where they can enjoy boating and fishing. A heritage city, Thanjavur was once the historic capital of the glorious Cholas. Thanjavur today is an important center for art and architecture and the foremost of them is the UNESCO monument the great Brihadeshwara temple built by King Raja Raja Cholan. Thanjavur is also well-known for its paintings and art which makes this city a treasure trove of heritage. Important sights to visit in Thanjavur would be Gangaikonda Cholapuram – a lovely city replete with temples built by Raja Raja Cholan’s son Rajendra Cholan, Thirunallar Temple, Thanjavur Royal Palace and the Serfoji Sarasvati Mahal Library. Mysore (Mysuru) is Karnataka’s second largest city, South India’s preferred cultural holiday destination and home to lush green gardens and royal palaces. Formerly the seat of the Wadiyar Royal Family, Mysore is full of historical and cultural attractions to get mesmerized by. The most famous and grand of them all is the Mysore Palace, where culture, heritage, and history create a stunning confluence. Travelers can visit the magnificent Chamundeswari temple at Chamundi Hills, 13km from Mysore, and enjoy a walk on the sprawling lush green lawns of the Brindavan Gardens, which also has fountains and flowering trees. 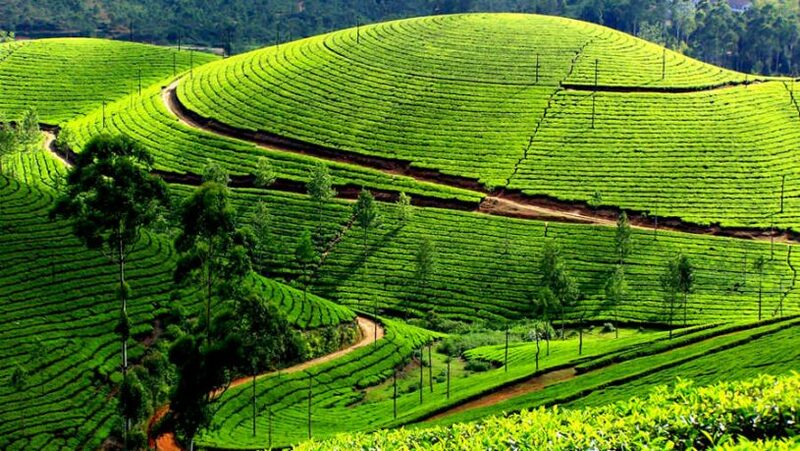 The sleepy, non-commercial hill station of Vagamon has aptly been nicknamed as the ‘Scotland of Asia’ for its pine forests, lakes and valleys. Located at the confluence of three hills in the Idukki district, the verdant retreat of Vagamon is a great place to enjoy a relaxed, chilled-out vacation. One can visit Vagamon in March-May or September-January to indulge in the exhilarating sport of paragliding. They can also visit the Murugan and Mooppanpara summits for the views, the Mitraniketan and Kurisumala ashrams, and the Vagamon meadows and the lake. The tranquil, scenic watery realm of Alleppey, or Alappuzha, is the nucleus of Kerala’s backwaters. Also known as the ‘Venice of India’, the verdant, graceful Alleppey is famously home to thousands of houseboats, villages, paddy and rice fields, toddy shops and canoes. If travelers have gone with friends, they can ride through and explore the bylanes of Alleppey on bicycles. One can stay on the houseboats to experience the simple, rustic village life. One can also visit the Arthunkal and St. Mary Forane churches, the Ambalapuzha temple, the Krishnapuram Palace and the Marari and Alleppey beaches. A perfect weekend getaway, Bangalore, also known as the ‘city of gardens’ is the capital of Karnataka. Salubrious weather and cosmopolitan outlook make Bangalore a great city to hang out especially during the weekend. Shopping malls, restaurants, pubs and discotheques dot the landscape of this city – all designed to make your weekend all the more fruitful. A historic city, there is no dearth of places to visit here – shopping in MG Road is given, a visit to the majestic Bangalore palace owned by the Wodeyar royal family is a must too. Bannerghatta National Park is one of the most enjoyable tourist attractions here along with popular parks such as Lal Bagh. One can visit the city of Madurai on a day’s trip or chill in Coonoor or Ooty which are just three hours away. Within Pollachi, apart from the ancient 8th century Subramanyar temple, one can visit the three dams of Azhiyar, Nirar, and Meenkara, the Azhiyar Siddashram, the Anaimalai Wildlife Sanctuary and the Indira Gandhi National Park. The town center has various hotels and guesthouses catering to all kinds of tourists, and the town outskirts have many luxurious river and jungle resorts as well. This elegant luxury resort is perfect to play your comforting abode. The accommodation here is not just well-appointed but exudes sumptuousness with voguish decor and landscaping. Accommodations at this Luxury Resort on Meenkarai Road are an assortment of individually-styled suites to cater to the personal requirements of guests. During movie shooting times and peak seasons, it isn’t easy to find taxis in the region. 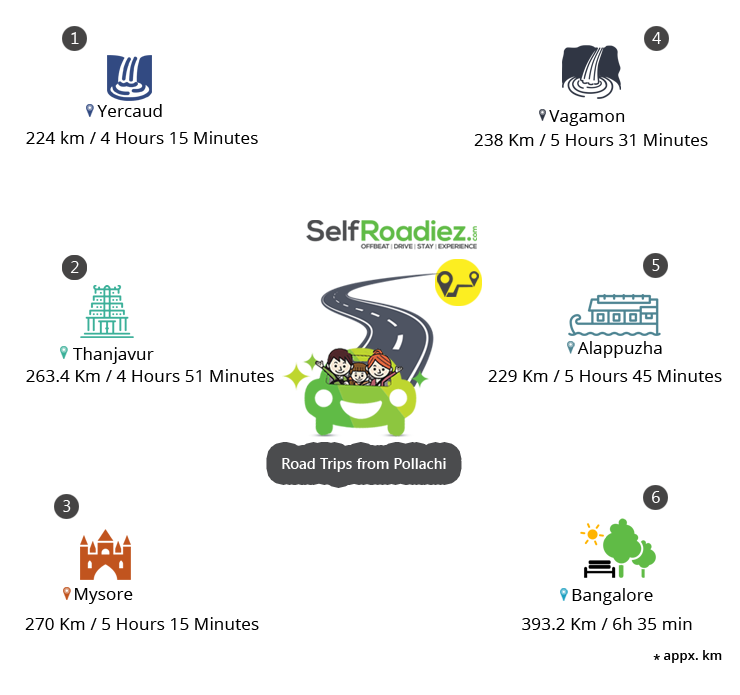 Hence, it is advisable to book your cab to get to Pollachi well in advance. Pollachi is a well-rounded town and can draw the interest of every kind of traveler.